"Whoa, Bob. Check this out." "I just found this spider on my hair. I must have walked into a spiderweb when I was outside." "Mom, I'm just gonna say your hair is crazy." 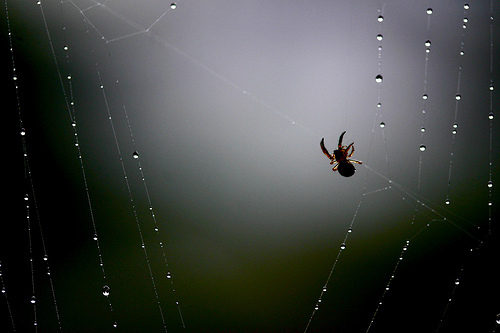 We have webs around here that you BOUNCE OFF OF! Love you, you crazy-haired mother of Bob. I am waaay impressed by your resolve after finding a spider in your hair! Gaaaaahhhhhh!!!! Bob's resolve is even better, though. Ha ha ha. oh my, my son would have passed out. Umm... I would have died upon finding a spider in my hair. What else are you hiding in there, Mom?